Solid waste landfills are a necessity in modern-day society, because the collection and disposal of waste materials into centralized locations helps minimize risks to public health and safety. Solid waste landfills, which are regulated differently than hazardous waste landfills, may accept a variety of solid, semi-solid, and small quantities of liquid wastes. Landfills generally remain open for decades before undergoing closure and postclosure phases, during which steps are taken to minimize the risk of environmental contamination . Municipal solid waste (MSW) landfills accept nonhazardous wastes from a variety of sources, such as households, businesses, restaurants, medical facilities, and schools. Many MSW landfills also can accept contaminated soil from gasoline spills, conditionally exempted hazardous waste from businesses, small quantities of hazardous waste from households, and other toxic wastes. Industrial facilities may utilize their own captive landfill (i.e., a solid waste landfill for their exclusive use) to dispose of nonhazardous waste from their processes, such as sludge from paper mills and wood waste from woodprocessing facilities. Although landfills are an indispensable part of everyday living, they may present long-term threats to groundwater and also surface waters that are hydrologically connected. In the United States, federal standards to protect groundwater quality were implemented in 1991 and required some landfills to use plastic liners and collect and treat leachate . However, many disposal sites were either exempted from these rules or grandfathered (excused from the rules owing to previous usage). Although the federal rules marked a significant improvement in the management of solid waste, some think that these rules do not go far enough. There is an increasing belief among solid waste experts that unless further steps are taken to detoxify landfilled materials, today's society will be placing a burden on upcoming generations to address future landfill impacts. Much of the concern revolves around leachate, the watery solution that results after water passes through a landfill. Leachate composition varies relative to the amount of precipitation and the quantity and type of wastes disposed. In addition to numerous hazardous constituents, leachate generally contains nonhazardous parameters that are also found in most groundwater systems (see above table). These constituents include dissolved metals (e.g., iron and manganese), salts (e.g., sodium and chloride), and an abundance of common anions and cations (e.g., bicarbonate and sulfate). However, these constituents in leachate typically are found at concentrations that may be an order of magnitude (or more) greater than concentrations present in natural groundwater systems. 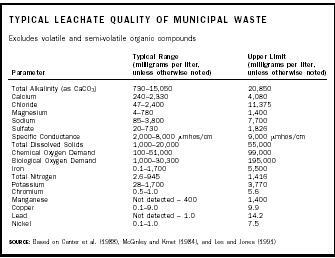 Leachate from MSW landfills typically has high values for total dissolved solids and chemical oxygen demand , and a slightly low to moderately low pH . MSW leachate contains hazardous constituents, such as volatile organic compounds and heavy metals . Wood-waste leachates typically are high in iron, manganese, and tannins and lignins. Leachate from ash landfills is likely to have elevated pH and to contain more salts and metals than other leachates. A release of leachate to the groundwater may present several risks to human health and the environment. The release of hazardous and nonhazardous components of leachate may render an aquifer unusable for drinking-water purposes and other uses. Leachate impacts to groundwater may also present a danger to the environment and to aquatic species if the leachate-contaminated groundwater plume discharges to wetlands or streams. Once leachate is formed and is released to the groundwater environment, it will migrate downward through the unsaturated zone until it eventually reaches the saturated zone . Leachate then will follow the hydraulic gradient of the groundwater system. Monitoring wells at landfills allow scientists to determine whether contaminants in leachate are escaping into the local groundwater system. The wells are placed downgradient of the landfill at appropriate depths and at various intervals to intercept any contaminants and monitor their movement. A number of forces may act on or react with the migrating leachate, resulting in changes of chemistry and a general reduction of strength from the original release. These forces are physical (filtration, sorption, advection, and dispersion), chemical (oxidation-reduction, precipitation-dissolution, adsorption-desorption, hydrolysis, and ion exchange), and biological (microbial degradation). The extent of these reactions depends on the materials underlying the landfill, the hydraulics of the groundwater system, and the chemistry of the leachate. Although many of these reactions have the capability to reduce the potential impact to groundwater, some (such as microbial degradation) can actually increase the toxicity by producing by-products that are more hazardous than the original contaminant. This can be seen, for example, in the creation of vinyl chloride from the degradation of trichloroethene. Today's landfills are constructed with liners that contain leachate, and leachate collection systems that collect it. But historically, many landfills were constructed without liners or leachate collection systems. Two philosophies previously existed regarding the placement of unlined landfills. One viewpoint was to place most of these facilities in moderately permeable materials and as close as possible to rivers or streams (i.e., surface water). This type of siting would allow the landfills to slowly (and deliberately) leak leachate into the groundwater, minimizing the length and size of the leachate plume, which would ultimately discharge into surface water. The other theory was the exact opposite: to place landfills as far away from surface water as possible. This may have spared impacts to the surface water, but locating unlined facilities in this fashion usually resulted in creating significant leachate-contaminated groundwater plumes that followed the direction of groundwater flow. The U.S. Environmental Protection Agency issued standards for MSW landfill design and operation in 1991. These new rules were adopted to protect groundwater from the release of leachate by MSW landfills. Landfill owners who could not meet these new design standards requiring plastic liners and leachate collection were required to close and to conduct groundwater monitoring for 30 years. Groundwater protection standards were developed for all MSW landfills, setting a national precedent for solid waste management that may eventually become the standard for all types of landfills. As the twenty-first century opened, there was a controversy whether the new rules for MSW landfills offer adequate environmental protection, especially as these facilities age. Landfill designs that utilize plastic liners below the waste and then are covered with plastic when the landfill stops placing waste into the active cell (area of waste input) are referred to as "dry tombs." These engineered systems are designed to minimize leachate generation by restricting the introduction of moisture, primarily precipitation. It is widely recognized that even the best-installed plastic liner will succumb to deterioration and eventually will allow leachate to be created and released. However, this may not happen within the required 30 years of postclosure groundwater monitoring. Moreover, it may not be detected during the time the landfill operators are actively involved and financially obligated. Opponents of dry-tomb landfills advocate for recycling the collected leachate through the waste, which will enhance the rate of chemical reactions inside the landfill and eventually stabilize the waste material prior to covering the landfill. This could reduce the toxic nature of the waste materials in the closed landfill and minimize the future threat posed to groundwater from these facilities. SEE ALSO Groundwater ; Pollution Sources: Point and Nonpoint . Canter, L. W., R. C. Knox, and D. M. Fairchild. 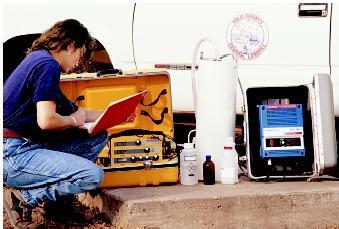 Groundwater Quality Protection. Chelsea, MI: Lewis Publishers, 1988. Lee, G. Fred, and A. R. Jones. "Groundwater Pollution by Municipal Landfills: Leachate Composition, Detection and Its Water Quality Significance." Proceedings of the National Water Well Association Fifth National Outdoor Action Conference, Las Vegas, NV, 1991. Lee, G. Fred, and A. R. Jones. "Landfills and Groundwater Quality." Groundwater 29 (1991):482–486. McGinley, P. M., and P. Kmet. Formation, Characteristics, Treatment and Disposal of Leachate from Municipal Solid Waste Landfills. Wisconsin Department of Natural Resources Special Report, 1984. "MSW Disposal." U.S. Environmental Protection Agency, Office of Solid Waste. <http://www.epa.gov/epaoswer/non-hw/muncpl/disposal.htm> .